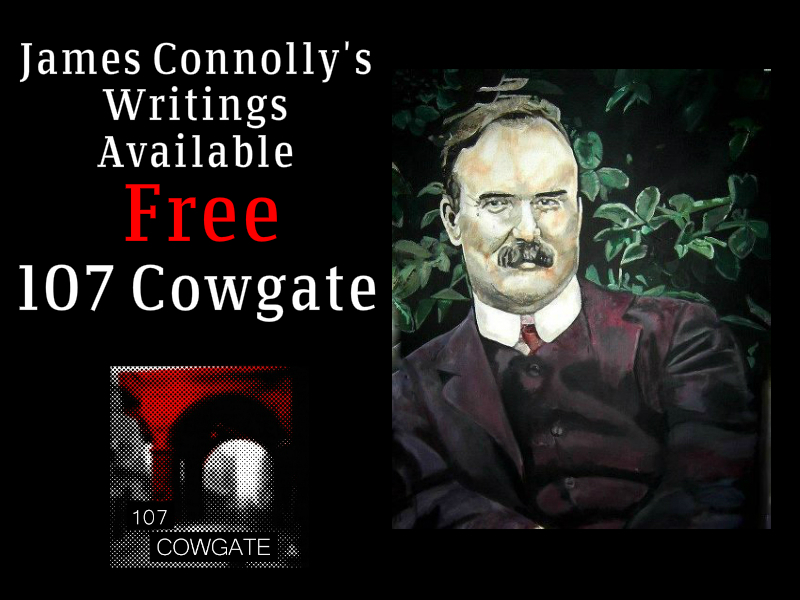 As part of a new initiative to bring the writings of James Connolly to a wider audience 107 Cowgate will be republishing Connolly’s writings exactly 100 years to the day of their original publication. This initiative is being developed in conjunction with the James Connolly Society’s ‘Return to Connolly’ strategy. As we approach the centenary of the Easter Rising it is understandable that there will be a focus on Connolly’s execution and the past. We fully support working class projects commemorating the revolution started in Dublin in 1916. 107 Cowgate endorse the approach of the JCS to focus on Connolly’s life rather than his death. And we feel it is important in that context that Connolly’s writings are made available for free. Of late we have been getting accustomed to this new phrase, economic conscription, or the policy of forcing men into the army by depriving them of the means of earning a livelihood. In Canada it is called hunger-scription. In essence it consists of a recognition of the fact that the working class fight the battles of the rich, that the rich control the jobs or means of existence of the working class, and that therefore if the rich desire to dismiss men eligible for military service they can compel these men to enlist – or starve. Thus under the forms of political freedom the souls of men are subjected to the cruellest tyranny in the world – recruiting has become a great hunting party which the souls and bodies of men as the game to be hunted and trapped. The first step in the economic conscription of Irishmen was taken when the employers of Dublin locked their workpeople out in 1913 for daring to belong to the Irish Transport and General Workers’ Union. Does that statement astonish you? Well, consider it. In 1913 the employers of Dublin used the weapons of starvation to try and compel men and women to act against their conscience. In 1915 the employers of Dublin and Ireland in general are employing the weapon of starvation in order to compel men to act against their conscience. The same weapon, the same power derived from the same source. The great lock-out in 1913-14 was an apprenticeship in brutality – a hardening of the heart of the Irish employing class – whose full acts we are only reaping to-day in the persistent use of the weapon of hunger to compel men to fight for a power they hate, and to abandon a land that they love. The first great forward step of man was made when he understood the relation between cause and effect – understood that a given action produced and must produce a given result. That no action could possibly be without an effect, that the problem of his life was to find out the causes which produced the effects injurious to him, and having found them out to overcome or make provision against them. The security of the working class of Ireland then has the same roots as the security of the people of Ireland as a whole. The roots are in Ireland, and can only grow and function properly in an atmosphere of national freedom. And the security of the people of Ireland has the same roots as the security of the Irish working class. In the closely linked modern world no nation can be free which can nationally connive at the enslavement of any section of that nation. Had the misguided people of Ireland not stood so callously by when the forces of economic conscription were endeavouring to destroy the Irish Transport and General Workers’ Union in 1913, the Irish trade unionists would now be in a better position to fight the economic conscription against Irish nationalists in 1915. The sympathetic strike with its slogan, ‘an injury to one is the concern of all’, was then the universal object of hatred. It is now recognised that only the sympathetic strike could be powerful enough to save the victims of economic conscription from being forced into the army. We want and must have economic conscription in Ireland for Ireland. Not the conscription of men by hunger to compel them to fight for the power that denies them the right to govern their own country, but the conscription by an Irish nation of all the resources of the nation – its land, its railways, its canals, its workshops, its docks, its mines, its mountains, its rivers and streams, its factories and machinery, its horses, its cattle, and its men and women, all co-operating together under one common direction that Ireland may live and bear upon her fruitful bosom the greatest number of the freest people she has ever known.